A lower body lift is a surgical procedure performed by our plastic surgeon to remove excess skin and fat from the abdomen, hips, and lower back, to lift the buttocks and outer thighs and to tighten the underlying muscles of the abdominal wall. This comprehensive procedure is normally performed after an individual loses excessive weight, either through their own weight loss plan or after gastric bypass or bariatric surgery. Significant weight loss over a short period of time (12-18 months) can cause the skin to lose elasticity, causing large amounts of excess hanging skin which affect personal appearance and personal hygiene. The best candidates for the procedure are men and women who have lost large amounts of weight, are close to their total weight loss goal and are bothered by loose skin in the abdomen, hips, thighs, under arms and buttocks. While a body lift will accomplish major reshaping of the body, patients who have undergone extensive weight loss or gastric bypass surgery usually have numerous areas of concern and may require several procedures. Procedures such as breast lift and/or breast augmentation address the loss of breast volume and droopiness; arm lift addresses hanging skin under the arms, thigh lift addresses loose skin of the inner and outer thighs and, lastly, facelift and eyelid procedures treat loose skin around the face and eyes. 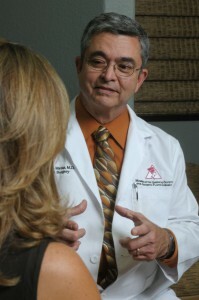 At your initial consultation, Dr. James Matas will discuss your goals and motivations for this type of surgery, along with assessing your physical and emotional health and reviewing information you provide about previous surgeries, pregnancies, past and current medical conditions, as well as nutritional supplements, herbal remedies and pharmaceutical medications you take. When asked about medications, be sure to include use of any vitamins and herbal preparations, as these can have a marked effect on your blood pressure and clotting abilities. Your use of alcohol and tobacco are also very important, as they have a significant effect on your ability to heal following this type of procedure. After reviewing your medical history, he will help you assess your anatomy and your priorities to help you develop a comprehensive plan for your body contouring. First, incisions are made beginning at the back of the waist in the lower back region. Excess skin and fat are removed from the back area, and drains are placed beneath the skin to control excess fluids and swelling. Heavy-duty sutures close and tighten the affected areas. Once the new contour has been achieved from the back, you are turned over to address the front abdominal area. Next, the incision is carried around from the back area over each hip. An extension of this incision extends from hipbone to hipbone and is just above the pubic area. An additional incision is made around the navel. The skin and accompanying fat is lifted to access the muscles of the abdominal wall, which run from pubic hairline to just below the bra line. These muscles are brought together and tightened by permanent sutures. The skin, with attached fat, is stretched down and removed. The navel is then repositioned and stitched into place. Drainage tubes are placed beneath the skin to minimize fluid buildup. Finally, the incisions are brought together with several layers of suture and surgical staples. A sterile dressing is applied over the incisions, and an abdominal binder is placed around your waist. This binder helps support your incisions during healing, decreases swelling and holds your abdominal muscles in a supportive manner. Lower body lift surgery takes about 6 – 7 hours to perform under general anesthesia. It is performed in our accredited surgical facility or a hospital, and requires an overnight stay with an experienced nurse monitoring you and your medications. For the first few days, your abdominal muscles will be extremely tight, with swelling, pain and discomfort, and you may find it difficult to stand up straight during this time. Over the first week, all support staples and sutures will be removed from your abdomen, hips and back. You will be wearing an abdominal binder for support during the next few weeks. Although light activity is expected, it is important that you receive plenty of rest during this time. During the first several weeks, our licensed massage therapist will use a special massage technique to reduce your swelling and discomfort and increase your mobility. In two weeks, you can usually go back to light work. After several weeks, bruising and swelling will subside and you may gradually increase your activity and exercise. Vigorous exercise is to be avoided for six to eight weeks. Your scars will be red during the initial months, and should lighten in color and flatten within the first year. It is important to protect your scars for one year from the sun and tanning beds to prevent them from darkening. Scarring is permanent, but hidden under most clothing and bathing suits. After body lift surgery, you will notice a dramatic improvement to your body shape and contour, specifically in the hips, thighs, back and abdomen. With 5 to 15 pounds of extra skin removed, you will feel lighter and be able to move around more freely. Your physical activity level will increase, as well as your motivation to be socially and personally active.